I am thrilled to start the new year off with such encouragment as receiving an award. 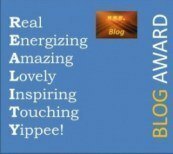 Deirdre at CrustyBreadBlog has been kind enough to nominate Inner Angels & Enemies for The Reality Blog Award! Please go check out her fabulous blog if you haven’t already, you will be boosted in faith and inspiration. My apologies to those who didn’t get a nomination, I am on holidays and even arranging this reply is taking up so much time away from my family so I must be off.. Blessings to you all!